We simmer for hours; you spread in minutes. 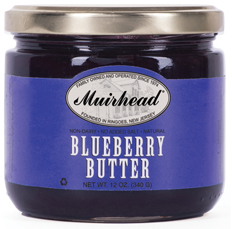 Muirhead Foods' goal, as it has been for the past 25 years, is to give you wholesome and tasty fruit butters. You can eat them straight out of the jar, snack on toast, or bake into one of our recipes. 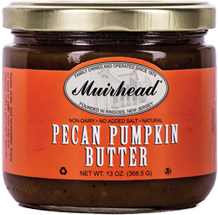 Choose our award-winning Pecan Pumpkin Butter that's lush with pecans. 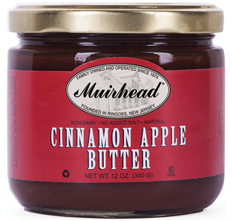 Try our traditional Cinnamon Apple Butter or our no-sugar-added Spiced Apple Butter. New to Muirhead? Start with a 2-pack or stock up with an economical 6- or 12-pack. Fruit Butters Healthy snacks. No preservatives. The butter that started a trend. It won the National Association for the Specialty Trade (NASFT) award. Swirl this lush-tasting butter into hot oatmeal, add it to pies, and celebrate with it throughout the holiday season. Savor its classic sweet yet tangy taste. Spread on wheat toast or stir into steaming hot oatmeal. Simple dessert: Use as filling in tart shells, top with sliced apples. All fruit flavor and piquant spices, no added sugar. The healthy snack. Of course, you can add honey or sugar. 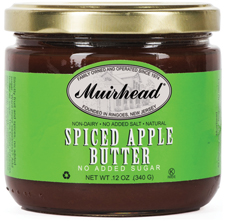 This butter enhances, apple crisp and yogurt, and tastes great on a Cheddar cheese slice. Blueberries are lightly flavored with lemon and brown sugar. Use on toast and pancakes. An easy filling that gives crepes a rich blueberry taste and the look of a fancy dessert. Select a pack from the list above to start, then select the fruit butters you want in your pack. 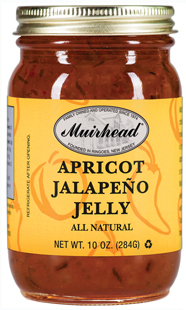 All natural apricot jalapeño jelly, with organic apricots. Smooth, sweet taste with a surprising "gotcha" bite. 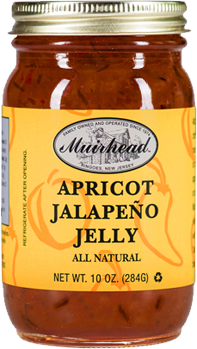 Great on crackers and goat cheese or as a barbeque glaze. 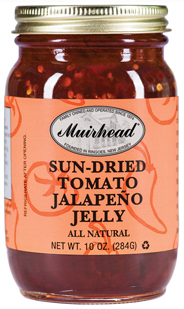 Muirhead jalapeño jellies are all natural with no artificial food colors. Use when grilling meat or fish, making sandwiches, and fixing appetizers with goat or any soft cheese.